Climbing is a fundamental movement and a cornerstone of any good CrossFit athlete’s skill set. In many ways, it’s the running of the upper body: it’s an essential part of how we evolved, and it’s a type of physical activity that we’re designed to train. Rope climbs are the best way of training this movement since we don’t have any trees in the gym. 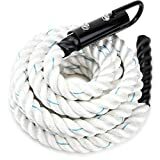 We’ve put together a list of the best climbing ropes on the market and how they stack up, so you can make an informed decision on what you should spend your time scrambling along at your home gym. 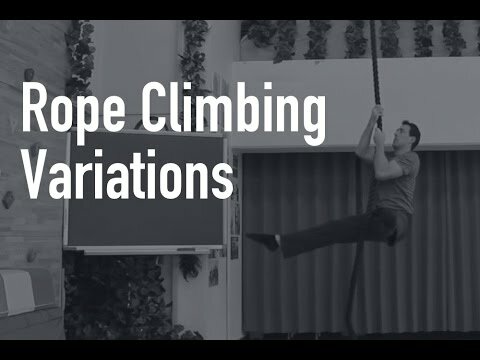 Climbing Ropes: What? Why? How do you Choose? The reason you need a climbing rope is that it is one of the best tools for improving your upper body and core strength. It’s a simple part of any functional training/CrossFit training plan, and it will provide you with a bunch of great exercises. 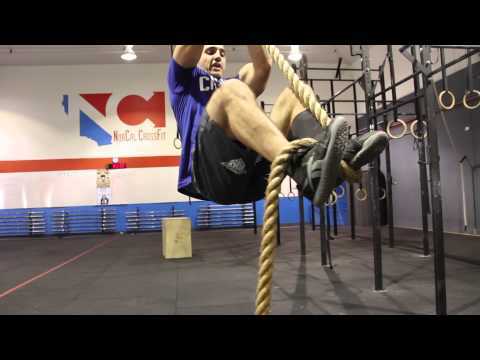 Rope climbs are a key tool for gymnastic strength, as well as conditioning. It’s so important that US gymnastics coach Christopher Sommer claims it’s a necessary stepping stone between rings and pull-ups, or pull-ups and muscle ups. The way we’re going to discuss the rope today is simple – we focus on durability, the material, and any features that make one product stand out. The differences will make them more or less appropriate, but these are all great products if you want to build a strong upper back and core! 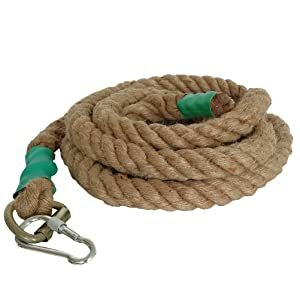 This product is a great standard climbing rope. It’s versatile, and fulfills all the expectations you might have of a climbing rope. It’s a heavy weave manila rope, with a maximum weight of 16,000lbs. Clearly, it should support your weight during any type of climb, and will be durable enough for weighted climbs. This durability is a big showing point for this product – with endorsement from countless CrossFit gyms and even the US military. If you want to train for military fitness, you need to get comfortable with it! This product boasts a total lack of metal attachment clasps. On the one hand, this does mean that you’re going to have to deal with tying and securing the rope. However, this does make it a much more durable product: there’s no likelihood of the metal clasp breaking (a common complaint about other products). The diameter of this rope is certified to match those used in various tests – from the CrossFit games to military testing/training protocols. Clearly, this product has been designed to focus on the fundamentals and if you’re looking for a rope, it’s a great choice. The only problem with construction is that splintering isn’t unheard of – but that seems to be a risk with all climbing ropes. Negative reviews on this product take two themes: easy-fraying of the rope and a pungent smell of gasoline or other chemical-heavy odors. The fraying is an occasional problem, while the smell may be fixed with airing. 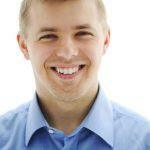 These are less of a concern than persistent problems with the customer service provided by RopeFit. Make sure to check all parts and keep your return policy close by! Valor Fitness is involved in workout equipment from belts to chains to ropes. 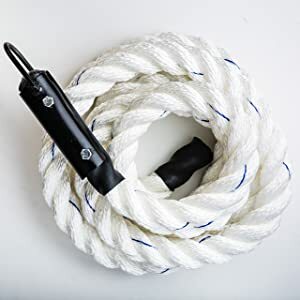 We’ve heard problems with their customer service on other products, but they’ve managed a consistent 5* review on the Sisal climbing rope, which is a great start. The material for the Sisal climbing rope is much lighter and more hand-friendly than the RopeFit, though this is because the rope is generally a lighter-duty product. It has a weight limit of around 300lbs which is a lot, but it might not provide the same reliability. 300lbs isn’t a huge amount for a larger human who plans on adding weight to their climb. The diameter is regulation size at 1.5”, and the length is a standard 25ft. It includes the same rubberized end-cap and slip-point securities. This makes it a great, versatile choice for your home gym and it has no malfunction-prone moving parts. Simply tie it tight and get climbing. The overall specs for this product make it a great contender for an entry-level rope. The cost is very reasonable, it’s not going to burn your hands to pieces, and the weight limit suggests that it’s designed for unweighted climbs. 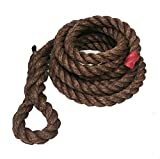 This is going to be essential info if you’re thinking about buying this rope. Aoneky’s ropes come in both natural manila and multi-colored synthetic weaves. This variety is a great tool for customers since our needs differ and the rope you need depends on your goals and situation. The manila rope is similar to the RopeFit model with a coarser material and greater weight-tolerance. It’s a standard rope and comes in lengths from 10ft to 30ft and a selection of widths from 1.18-1.5 inches. There’s a regulation size rope, but it’s clearly not the focus of Aoneky’s products. The multi-color, synthetic rope is likely to be much gentler on the hands, though it will lack the strength and weight-tolerance of the manila counterpart. There’s no concern, however, as the manila rope’s weight tolerance is way more than you’ll need. The real problem is that the synthetic rope doesn’t come in regulation CrossFit/Military sizes. However, this doesn’t seem to be affecting customers, who have all provided 4-5 star reviews. The only consistent problems are related to the rubber covers which are likely to fall off. This shouldn’t affect the function of the rope for climbing, but it does expose joints to the elements and it is a concern for the build-quality. Overall, Aoneky’s choice is a great feature. 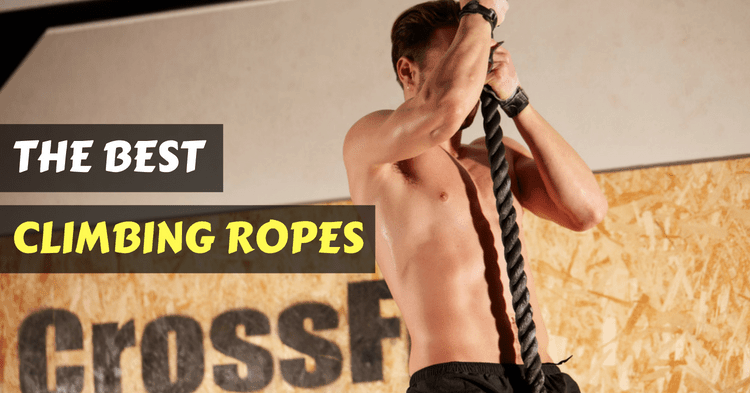 The synthetic rope is great for beginners but we wouldn’t recommend it for competitors in CrossFit as it’s a different experience to a regulation rope in both diameter and material. Another sisal rope, this one provides a good mid-ground between the entry level synthetic rope provided by the Aoneky brand and the more expensive, heavy-duty manila RopeFit. 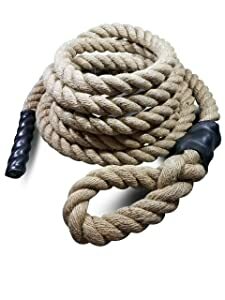 GSM’s sisal rope is very similar to the Valor brand. They provide exactly the same 300lb weight tolerance and can be seen as equally entry-level – they’re designed for beginners or intermediate trainees, not heavy or advanced athletes. As with the valor brand, the GSM rope is regulation size at 25ft x 1.5 inches. It’s a well-built piece of kit and has the same gentler grip sensation. You’re not going to shred your hands as much as a manila rope, though you’re also not going to be as comfortable as a synthetic rope. Overall, it’s a great middle-of-the-road for people just want a rope. The only consistently-reported problem for the Sisal rope is a combination of stiffness and shedding. There’s a possibility this is a construction problem but it’s only noted in a handful of reviews and could be due to storage problems – as Sisal needs to be kept in a room-temperature, dry environment. However, it does raise concerns so make sure that you’re breaking your rope in effectively. This is a slow process and you might find that it takes a while to reach the pliability you want. This is a great-looking product that really stands out on the market. It has custom rope length and diameter options, being a domestically-produced rope. While there are often ‘private-label’ products (that are bought wholesale and simply have a sticker or brand on them before sale), this is clearly a reliable in-house manufacturer. This range includes the standardized 25ft x 1.5 inch rope, but the variety means that your rope can be custom-made to fit your space. The material is a fine, tightly-woven rope with a fine weave and great finish. This seems to be the best compromise between hand-harsh manila and weaker synthetic weaves on the market. The rope attachment is a metal clasp which makes it easy to use with a simple, smaller rigging rope. However, the polymer blend is not designed for outside use. This isn’t a problem for most home-gyms, but it does mean you can’t use it on trees etc. 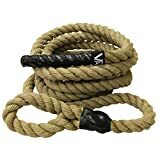 This is a great rope for indoor use, and it strikes a great balance between coarse, uncomfortable natural ropes while still providing a textured synthetic weave. This makes it a great mid-ground between manila and slippery synthetics, without the shed or weakness of a sisal rope. The only real complaints are stiffness (a temporary problem, as mentioned above), or the slickness of the rope. These are both temporary problems as synthetic rope becomes more “grippy” with wear. This can be immediately addressed with a simple spray treatment, though it does make it a little more difficult to use “out of the box”. 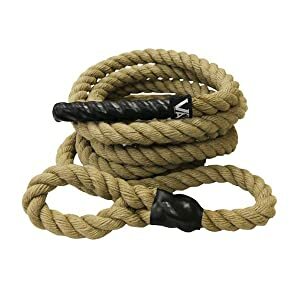 This rope is a much more severe version of the problems that faced the Fitness solutions rope: it is a conventional synthetic material which makes it easy on the hands, but “near unclimbable” on the grip. While the previous rope focused on a synthetic rope with a coarser grip, this rope is very tightly wound and slick. 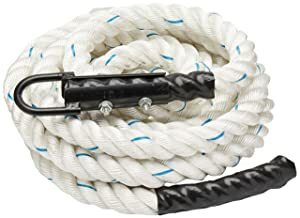 This is usually a temporary problem, but this particular rope’s design makes this a very long process and the initial use doesn’t seem to be possible. The tight wind and synthetic material also lead to a very stiff rope. This only increases the difficulty of using the rope from the start. It seems that this particular rope/material requires a serious set-up time to break it in, coarsen the rope and make it possible to climb. This seems to defeat the point of buying a rope for a home-gym, where durability and convenience are key. The problem with this rope could quite easily be figured out from the reviews: it suits children’s play more than a serious athlete’s training. The reviews are full of this focus, while the material and non-regulation sizings make it clear that it’s unsuitable for serious training. This is another example of the sisal rope we’ve seen with other brands. There is actually very little difference between the power guidance brand and other forms of sisal rope – they share everything from diameter to length-options to general build-quality. This is also true of some of the benefits like the heat-shrunk end-caps and the lack of metal attachment. This isn’t inherently bad – the Power guidance Sisal rope comes in a wider variety of lengths and options than either Valor or GSM. As with those models, it’s a lower-durability form of manila. 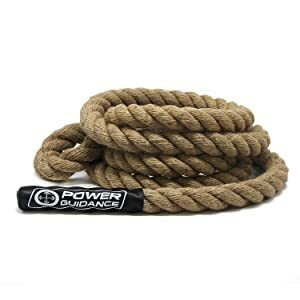 The only thing to separate the power guidance rope from others is that their reviews speak to a poor build quality. The knot itself has a habit of breaking and the sisal is of a low-quality. This is likely to be the case when comparing any sisal rope to a manila or strong synthetic, however. As with the comparable sisal ropes on this list, the main concern is that the durability is only suitable for entry-level athletes. There’s no way that this rope will provide the necessary support of a well-developed athlete to be using weight on their climbs – or putting it under the pressure of a rapid climb. In Power guidance’s defense, there are some redeeming factors to this build quality. The most important is that they provide a 100% satisfaction guarantee for money-back or replacement. This is an inconvenience that you don’t want to deal with, but it’s important that you have this assurance – a great sign compared to some of the customer service problems seen with RopeFit’s manila. The discussion of climbing ropes is one of the best adverts for the single most important piece of buying advice we have: buy a product that suits your needs. If you’re a beginner looking to find your feet in functional training or gymnastics, a simple sisal rope is the way to go. We’re fans of the Valor model – it is functionally the same as others on the market, but reviews are far more positive on the build-quality, which is a key aspect of a product like this. If you’re looking to shift some serious weight, rapidly, or you’re planning on taking a Military testing process, manila is going to be the way to go. This is a hand-feeling you need to get familiar with and learn to navigate. 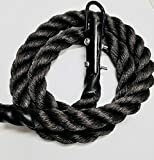 The RopeFit product would be a good choice if it wasn’t so fraught with poor customer-service concerns – as such, we’d recommend the Aoneky custom-cut manila rope. Finally, a synthetic rope is a bit specialist. The hyper-slick Poly Dac rope is okay for children’s play but lacks the convenience and usability of better models. 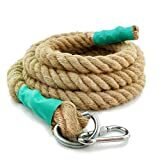 The Fitness solutions USA-made rope is a great choice for synthetic as it has a coarser build and is likely to age brilliantly, without tearing your hands or causing blisters. This understanding of your own goals is essential for getting the most from your rope purchase. If we were pushed to make a single suggestion, we’re going for the valor rope – it will have the best fit for the vast majority of people, but it’s important to realize that this is only a generalization!